1) Get good soil. Ask your local garden center to order a bag of professional-grade soil for you. This will be your biggest and most important expense. You get what you pay for with soil. Don't scrimp. 2) Cover the seeds with vermiculite and gently tamp them. 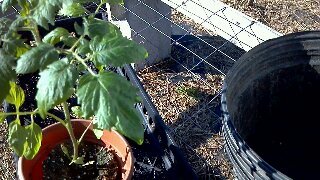 3) Water them like crazy until you see a sign of life even if it's a barely cracked seed. 4) QUIT OVER WATERING THEM! If you can see any green then it's time to start treating them like plants. 5) Water them when they are dry. Only when they are dry or wilting AND dry. Water them thoroughly and then let them dry out again. 6) Give them as much sun as possible. It is winter. Even direct light is weak. 7) Turn them regularly. 1/4 turn each day is ideal. 8) Put a fan on them occasionally if you've got one. With a greenhouse and a staff: We didn't usually cover the seeds and they had a moisture check twice a day. There was more light. We used bigger containers. There is a hose attachment called a water breaker 400. It makes your hose into a gentle rain. They are available retail under names like Dramm. We had a special pad to heat the soil from the bottom. It only knocked a day off the germination time. They make them for home use and I have one, but when I use it I usually don't get back to the seeds quickly enough and they dry out and get cooked to death. 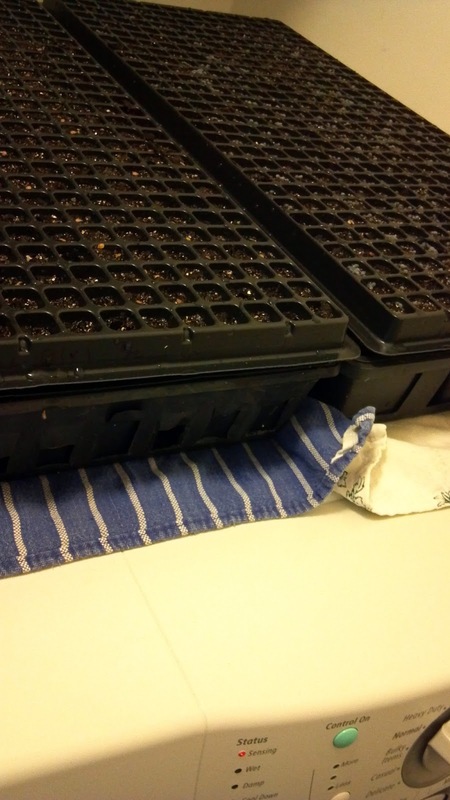 If you just have some patience you can save the cost of the mat and the cost of the seeds by letting them germinate naturally. The smaller your container, then sooner they will be ready to transplant. I use this crazy tray of 1/2 inch cells. They are ready in two weeks. They are small, yes. But big enough. And I don't have to try to remember them any longer than two weeks. Or be tied to my house because there is a newborn on my kitchen table. I have twins. I'm past that part and don't need to do it again. 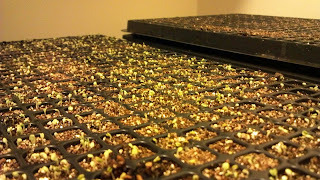 My seeds need to be out on their own ASAP. I have purchased and used humidity domes. These, like the heating pad, are a mixed blessing. All the little gadgets to help start seeds can help but they cannot make or break your experience. Just like an expensive camera doesn't make you a good photographer. 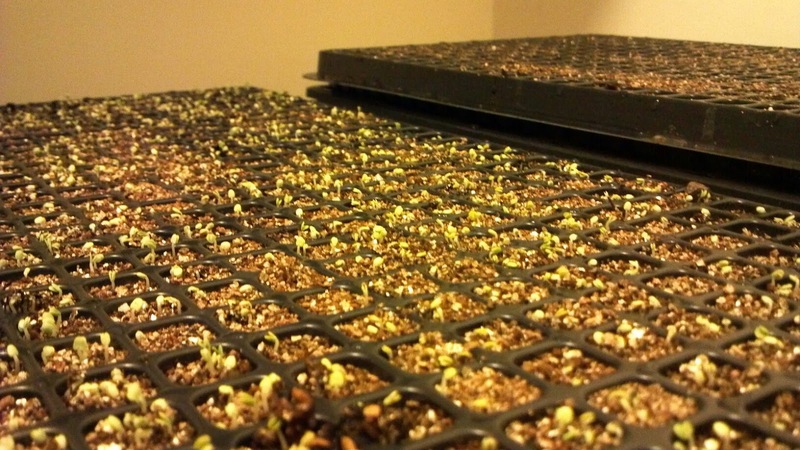 If you follow the steps above, you should get some tasty treats that are ready to transplant in the Spring! If you have any gardening questions for Caley's Culinary, leave them in comments and I will answer them!